Remember Christian Marclay’s The Clock, a cinematic tour de force of 24 hours that unfolds on the screen with thousands of film excerpts that are showing the real time? The film has been purchased by major museums throughout the world and has established the performer-provocateur as a central creative force, capable of sending us into unchartered artistic territories. 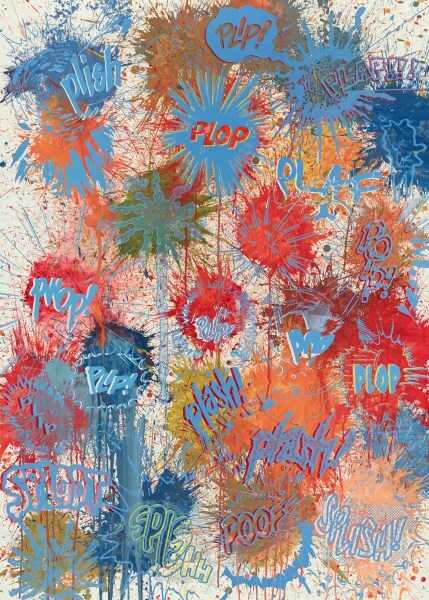 This time, the Swiss artist, who lives in London and New York, shifts our attention to sound, or rather to the silence of sound, when onomatopoeia allows us to hear what our eyes are telling us. Think of SQUISH or CRASH! The Aarau solo exhibition, entitled Action, features the immersive, space-activating video animation Surround Sounds (2014 – 15), early and lesser-known works as well as a large number of new paintings and works on paper. Marclay has a rare ability to make art playful. Until 15 November at Aargauer Kunsthaus, one of the leading art museums in Switzerland with an adventurous art programme.